To be honest, I was going to write about a different movie today to kick off the Oscar season, but a little discovery caused me to change my mind (more on that in a bit). Today’s film is a classic Hitchcock that I’m sure most readers have seen. If by some chance this film has eluded you all these years, please make sure to add it to your Netflix list immediately. 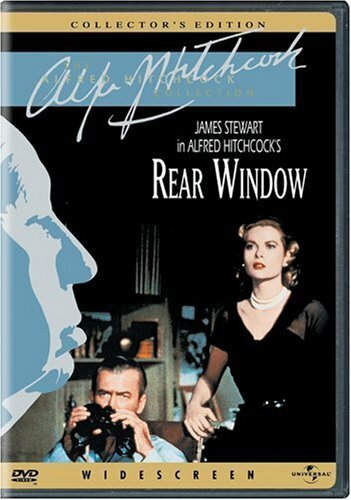 Rear Window showcases Hitchcock’s uncanny ability to focus on our human foibles and make them not only entertaining but suspenseful. Jimmy Stewart plays L.B. Jeffries, a photographer, wheelchair bound from a job related accident. Confined to his NYC apartment, he passes the time peering into his neighbors’ homes with his binoculars. Through Jeffries’ voyeurism, we get slice-of-life glimpses into the lives of those living across the courtyard – a young dancer (Miss Torso), above, a struggling composer, young newlyweds and “Miss Lonelyhearts,” for example. Add to this a wise-cracking Thelma Ritter as his visiting nurse, Grace Kelly as his “too perfect” fashion industry girlfriend and Raymond Burr as the suspicious husband across the way and you have a winning stylish yet thrilling combination. As Jeffries becomes convinced foul play is involved, the suspense builds to a nailbiting climax. 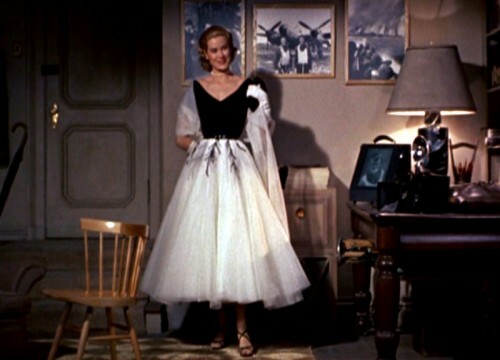 Playing a fashion maven, Grace Kelly’s outfits, designed by the legendary Edith Head, are divine, the most famous probably this classic black and white dress from the opening scene. 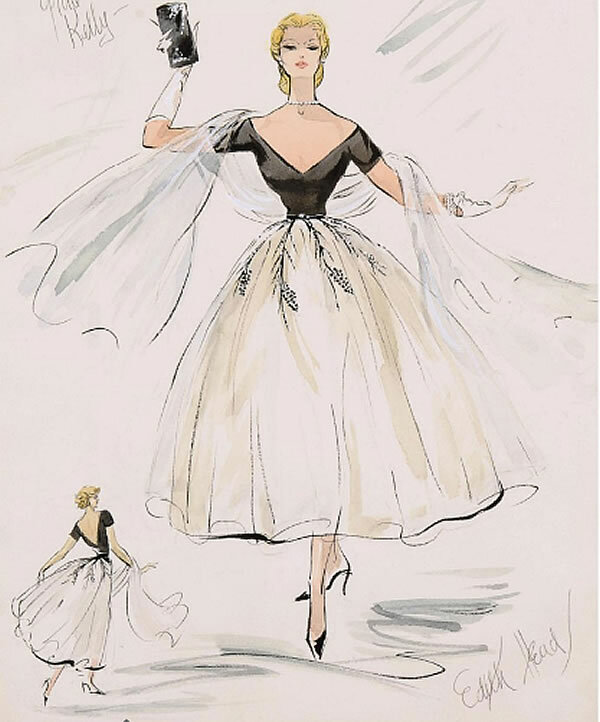 The original sketch for this dress, below, was sold at Christie’s for over $12,000 a couple of years ago. While the clothing in the film is stunning, the real star is the now famous Mark Cross bag that Kelly’s character carries. 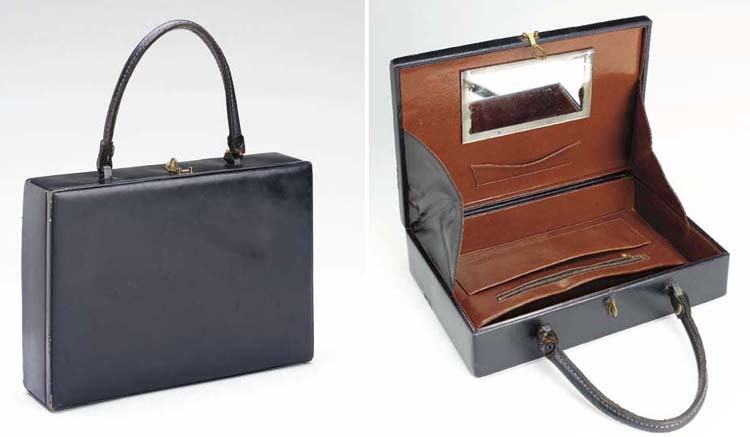 A chic box shaped purse, it opens to reveal a mirror and an area large enough to hold the negligee that emerges. 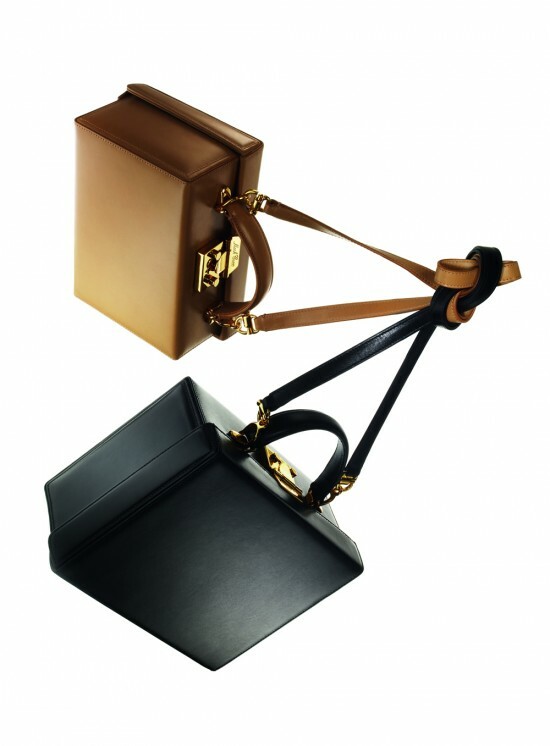 The combination of the classic tailored geometry and overnight bag-in-a-box appeal has led this to be one of the most coveted fashion items in films. The actually bag was also sold at Christie’s ten years ago. 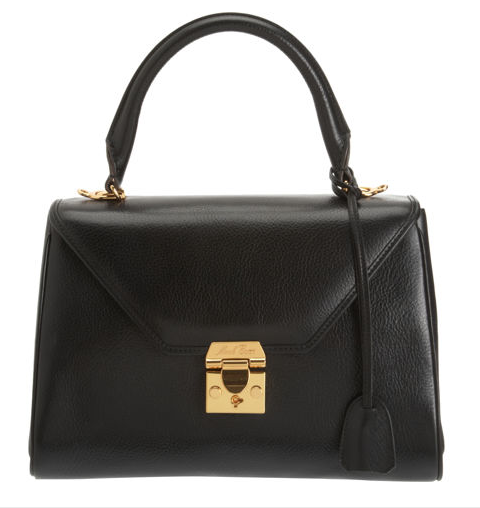 and of course the Grace box bag. There’s an idea that I’m sure someone will figure out eventually – shopping directly from the movies! In the meantime, enjoy this Hitchcock classic. This entry posted in auctions, bags, Christie's, entertainment, fashion, film. Entry Tags: Grace Kelly, Mark Cross, Mark Cross at Barney's, Rear Window Bookmark the permalink. How wonderful that Mark Cross is back! 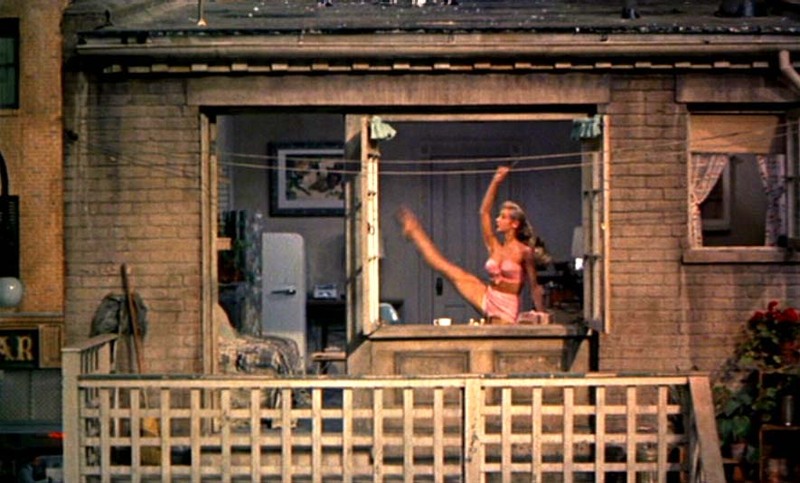 “Rear Window” is such a fabulous movie for numerous reasons. That “Hitch” was such a master. Grace Kelly, Jimmy Stewart, Raymond Burr and alfred Hitchcock…and a good story with a hefty dose of high fashion, what’s not to love? I love structured bags and spotted a few vintage bags the other day. They are perfect for organizing. Love the movie one of my all time favorites but those Mark Cross bags are fabulous! Enjoy your weekend! Oh, that original sketch is so lovely. How wonderful this must look framed in someone’s home! Ah now I understand! I was a bit surprised by your choice as it seemed like too obvious a choice for you! :) Yes, it is one of my very, very favorites of all-time. And I have a vintage Mark Cross train case that is just so lovely inside–I want to live in it! This is a favorite movie and I never tire of watching it because there is at least one new detail I notice each time. I love every accoutrement in this movie and I’m thrilled you discovered the reincarnation of Mark Cross. I am in love with that satchel! Q, you always pick movies that I love! I usually try to catch glimpse of the great monograms in these films – now I’ll be looking for bags too! Wish list! Love this post! Grace K. is gorgeous. Look at that dress and bag! I may be having a senior moment, but I don’t think I’ve seen this one. I’ve got to rent it this weekend! Mark Cross has the most beautiful line. Happy to learn they are back. I will have to watch the movie again. Thanks for the recommendation. Oh if that small satchel comes in tan, it’s mine! One of my favorite Hitchcock films. 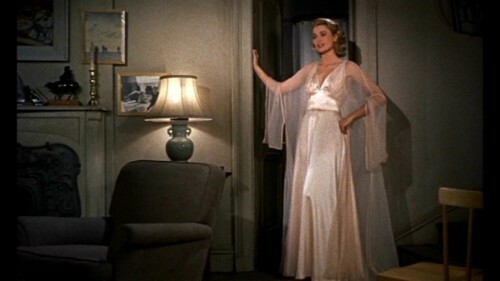 I admit I spent a great deal of time looking at Grace’s ensembles, so classic and she always was impeccable! The bags are divine! Oh I love this little tidbit of fashion/film history! She had such an amazing wardrobe in this movie! One of my favorite movies- I can watch it endlessly. Great post. 82 queries in 0.558 seconds.